Application and advantage exploration of GPS technology in coal mine survey WU Xin-heng;Anhui Hengyuan Coal-electricity Group Co.
Yang Cao Tang block 2200 middle section through survey practice BAI Zhang-chun;Yunnan Tin Industry Group Co. The application of ground well induced polarization logging in a polymetallic deposit in northern Shaanxi SHEN Ming-cheng;RAN Jun-lin;ZHANG Jian;LIU Jun-yan;Sino Shaanxi Nuclear Industry Group 211 Brigade Co. Determination of major and minor components in lead zinc copper ore based on X LI Lu-hong;ZHAO Shu-hong;Qinghai Hongxin Mining Co. The induced polarization method and controlled source audio magnetotelluric method in a gold mine in southern Shaanxi comprehensive effect LI Bo;YAO Hui-ming;LIU Kuan-hong;Zhongshan nuclear Industry Group Company;Shan nuclear industry group in the 214 group co.
And prospecting of ore deposits in Tibet County of Mangkam Seba HUANG Xian-ran;WANG Ting-dong;Sichuan Nuclear Industry Geological Survey;Sichuan Gold Mining Co. In yangchun hot tin polymetallic mine geological characteristics and ore-prospecting criteria analysis HAN Xin-qiao;Guangdong Guangye Yunliu Mining Industry Co. 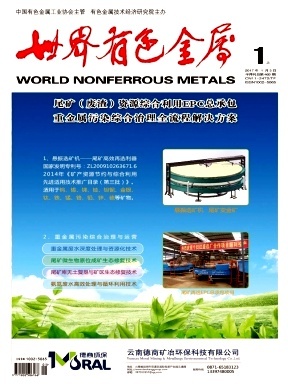 The lijiawan Ning Jiang county in shaanxi province area analysis of geological characteristics and prospecting prospect YAN Hong-qiang;LIU Zhong-dan;GUO Bin;Hanzhoung nonferrous Group Co. Determination of chemical composition of iron ore by X-ray fluorescence spectrometry TU Yun;LIU Zhi-yuan;ZHANG jie;FAN Jing;Xinyu iron and Steel Group Co.
Engineering survey in Lala copper mine open pit mine loss and dilution in the management work carried out WU Min;Liangshan mining industry Co.
Anchor precontrol roof next to the layered stoping method research JIA Yan-zhou;QUAN Ke;Shandong Yantai Xintai Gold Mining Co. The Ways to Improve the Production Capacity of Electric Shovel in Open- pit SANG Xu-gang;Yunnan Hualian Zinc Indium Co. Discussion on the technology of top filling in downward filling mining XU Pei-liang;Yunnan Tin Industry Co.
Bauxite underground mining technology and matters needing attention ZHOU Kuo-quan;WANG Huan;Kunming Engineening & Research Institute of Nonferrous Metallurgy Co.
Beryllium bronze heat treatment technology was studied YE Li-mei;Chengdu into navigation safety system co. Analysis of L18 three slitting rolling process optimization process WU Long-kun;Kunming iron and Steel Group Yuxi Xinxing iron and steel Co.
Prestressed concrete corrosion effect on the properties of high strength aluminum alloy structure fatigue YAN Chong-jian;Tianjin Silvery Dragon Prestressed Materials Co.
Mill plate shape control strategy and application Based on plate crown LIU Xin;Qinhuangdao Shouqin Metal Materials Co. Application of iron nickel base alloy CHEN Xiao-Jun;Inner Mongolia Shenzhou Silicon Industry Co. Replacement technology of blast furnace feeding belt machine ZHANG Ying-bo;Shanghai Baoyejianshe Industrial Furnace Engineering & Technology Co. Car body structure with steel composition control production practice SUN Jin-ming;shandong iron and steel group co.
On the detection and diagnosis about the fault condition of the slag vertical mill reducer LIU An;Qingdao special iron and steel co. Application of PBA hole pile method in subway station construction YANG Xiong;China Railway Wuju Group The First Engineering Co.
Construction technology of shaft in Metro Engineering LI Chang-liang;China Railway Wuju Group The First Engineering Co.
Summary on construction technology of pipeline modification in subway construction CHEN Tie-qiang;China Railway Wuju Group The First Engineering Co. The tunnel of tuffaceous slate area water rich fault fracture zone construction technique ZHANG Wen-jie;China Railway Wuju Group The First Engineering Co.
Economic benefit evaluation of S3 type distribution transformer for S11 type distribution transformer PANG Nuan-chun;BI Gang-zhi;Tin mine flash star antimony industry Co.
China's copper belt market present situation and development trend of research YUAN He-feng;Ningbo Xingye Shengtai Group Co.